Last month, World Economic Forum Founder Klaus Schwab set out a challenge to transform the narrative of globalization . While market-driven globalization has lifted over a billion people out of poverty, he said it has failed to meet the needs and aspirations of crucial segments of society who feel they are living in a precarious situation. This warning is relevant not only to Western Europe and the US, where the most dramatic political upheavals are taking place, but also to Latin America, where the World Economic Forum gathers this week in Buenos Aires to discuss the region’s future. United Nations reports tell us that 60 million people in Latin America were lifted out of poverty between 2002 and 2013. Yet since the commodity boom ended, the poverty rate crept up again from 28.2% in 2012 to 29.2% in 2015. In addition, a large body of people have not benefited from the expansion of social programmes over the last decade. To maintain the astonishing progress in social and economic gains seen at the start of this century, how can Latin America reshape the narrative of globalization for the benefit of its citizens? One approach is to take a lead in implementing the Sustainable Development Goals . The 17 Goals and 169 accompanying targets may appear daunting, but when integrated into existing policy frameworks, they are much more achievable. For example, Colombia’s government has already integrated 92 of the SDG targets into its National Development Plan, while Mexico and Venezuela have taken similar actions to build the goals into their policy frameworks and establish national indicators for progress. Another approach is to focus on the populations that have not benefited from the broad gains in progress over recent years, particularly women and young people. Latin America faces high and growing youth unemployment rates, with more than one in five young people neither employed nor in school. According to the Development Bank of Latin America, only 50.3% of women participate in economic activities in the region. Sustainable growth and resilient economies would be a much more realistic proposition with more women and young people incorporated in the workforce. That workforce is mainly found in small and medium-sized enterprises (SMEs), which account for more than 90% of companies in Latin America, and will be a major source of job creation and economic growth. However, several structural, social and psychological obstacles stand in the way of high-growth entrepreneurship, particularly for the unemployed. These barriers in Latin America include limited access to finance and entrepreneurship education; higher business costs; and regulatory hurdles to enter the market or start a new business. It seems that, even if many people have a strong desire to start a new business, they are discouraged by these hurdles. As the OECD notes, self-employed entrepreneurs can lose certain social security benefits . While Latin America and the Caribbean also reported the lowest proportion of adults believing that entrepreneurs are highly regarded on the Global Entrepreneurship Monitor (GEM). Although entrepreneurship will be vital for future growth and prosperity, unleashing its potential is no mean feat. Latin America boasts the highest levels of “capability perception” – 63% believe that they have the required skills to start a business – but the lowest proportion of medium-to-high growth entrepreneurs, at just 17%. So why doesn’t high self-belief translate into smart risk taking and high growth enterprises? Is this a case of inflated capability perception masking a crisis of confidence? If we dive a little deeper into the data, we see that women in Latin America, especially in economies at an earlier stage of development, are more likely to start businesses out of necessity rather than opportunity. 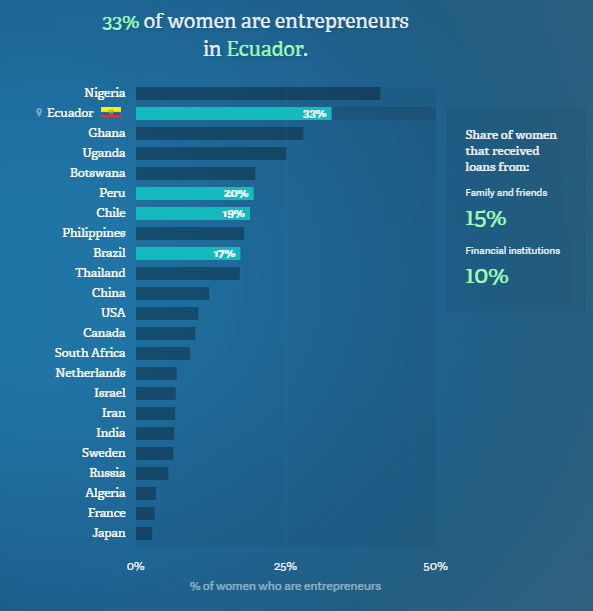 Even in countries with some of the higher rates of female entrepreneurship, such as Ecuador, Brazil, and Chile, women were far more likely to receive loans from family and friends than financial institutions. So how do you address the disparities in opportunity, gender and age at a national, policymaking level? Cutting red tape is one obvious policy solution, which countries like Chile, Colombia and Panama have adopted with positive results. However, the perception of entrepreneurship is as important as some of the structural barriers to its pursuit. The GEM report found the women interviewed in Latin America tended “to have lower confidence in their own abilities, coupled with higher fear of failure rates”. Providing the management skills to harness existing capital should be just as much a priority as improving access to finance. If Latin America can respond to one of the major complaints against market-driven globalization – its impersonal and remote governance structures – then local accountability must play a central role in empowering budding entrepreneurs to start and grow their businesses. One microcredit project in the Esmeraldas Province of Ecuador uses the group loan methodology to ensure sustainable entrepreneurial growth. Borrowers are organized into credit groups, and cross-guarantee each other’s loans. With credit officers working locally, the people who benefit – primarily poor women and youth – gain more confidence to start businesses, and are more likely to repay the loans. They also receive vocational, business and personal development training from NGOs including Rotary, FUDECE and the Grameen Cooperative, and SECAP, a government training organization. In a similar microcredit scheme in Colombia , 100% of the loans were repaid in the second phase of the project. These success stories can only be replicated on a larger scale in Latin America if we acknowledge two insights. First, the informal economy will be a major source of employment creation until formalizing new businesses becomes both cheaper and easier. Second, women and young people must believe that they have the skills and support needed to succeed as entrepreneurs. Through policy and sustainable local initiatives, we can give them not just confidence, but concrete steps to success. Even better, we can share the lesson of the world’s most innovative ecosystems; that early failure is not such a bad thing, if you have the opportunity to try again.